Asset price bubbles: how they build up and how to prevent them? It is a great pleasure for me to speak today at the University of Vienna, the alma mater from which I graduated many years ago. Many things that we have learned at the time of my studies were particularly useful in recent years. So I am happy to be back at the university and to provide you today with a policy maker’s perspective on the issue of asset price bubbles, a topic that has been rarely out of the news in the past few years. Against the background of the experience of the recent history, we now have the opportunity to reflect upon the tendency of economic systems to produce boom-bust cycles in asset prices. In my talk I want to focus on two main questions. Why do asset price bubbles arise and why are they so dangerous for the health and stability of the financial system? What can policy do about asset price bubbles? It is not very hard to find recent examples of asset price bubbles. 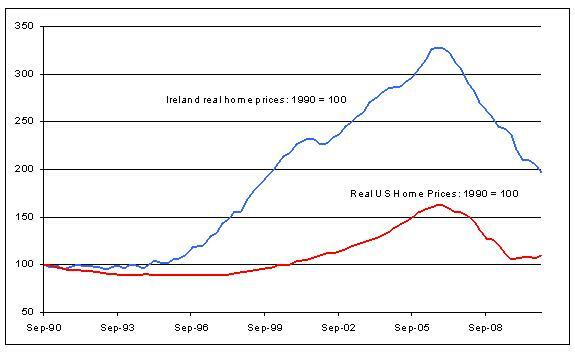 Chart 1 shows the evolution of real home prices in the United States and Ireland since 1990. Both economies show a sharp increase in home prices between 1995 and 2005. In Ireland prices more than tripled; in the US they rose by 70%. As we know today, these price appreciations ultimately proved unsustainable and in both countries, the housing market has fallen by a third since 2007. Such boom-bust cycles in housing prices are by no means only a feature of the recent past. 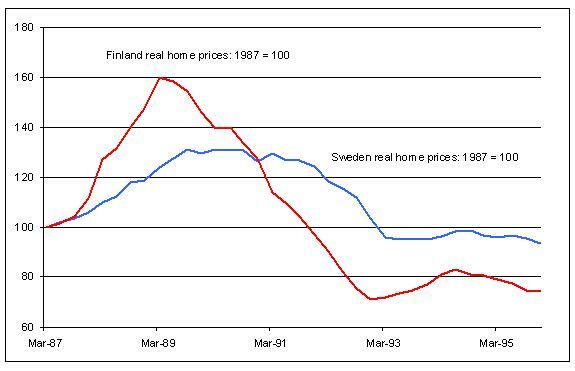 The Scandinavian economies went through a housing bubble of their own in the 1985-1995 period. As Chart 2 clearly shows, real estate prices rose and fell dramatically. In the cases illustrated in the two charts the housing bubble led subsequently to a financial crisis accompanied by a deep recession. More generally, economic historians – such as Charles Kindleberger  and others, have provided evidence that financial systems have a tendency to generate such financial boom-bust cycles, which sometimes take systemic dimensions that can cause or contribute to severe financial crises and recessions. But how can we define bubbles more accurately? One way to do so is as a deviation of the value of a financial asset from its ‘correct’ or ‘fundamental’ value. Broadly speaking, the ‘fundamental’ asset price is equal to the net present value of the cash flows which the owner of the asset is entitled to receive. Although it is easy to state in theory, this definition it is by no means easy to apply in practice for investors, regulators or central bankers. Forming forecasts of highly uncertain cash flows that stretch far into the future is a challenge, which not only requires substantial expertise but is also subject to the great uncertainty about the future values of factors influencing the asset price. For example, in 2005 – with the information available at that time – it was hard to make an unambiguously agreeable case that high US housing prices would not be confirmed by good fundamentals in the future. Although there were also warnings and some speculation on price drops. In the light of such complications, practitioners often resort to complementing fundamentals-based asset price assessments with comparing current prices with historical averages. If current prices exceed long-term averages by a sufficiently large margin, a warning signal is recorded that a bubble might be present and further analysis is triggered about whether it risks causing a crisis. I will come back to this later in my presentation. There are many reasons why the financial system may not value assets correctly, leading to bubbles and imbalances. Investors have a tendency to look for information from the behaviour of other investors. So buying and selling ‘herds’  can develop in financial markets on the basis of very little genuine news. 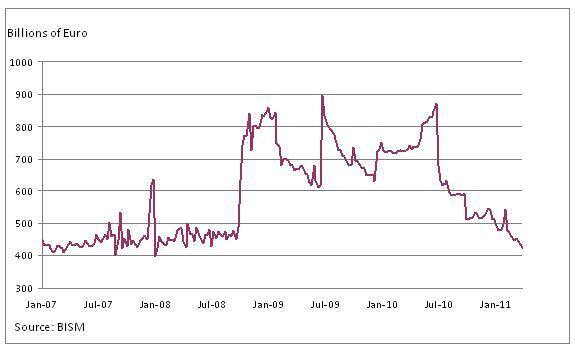 Imperfections in credit markets  can lead to boom bust cycles in money and credit quantities as well as asset prices. ‘Moral hazard’ could bring about excessive risk taking by financial intermediaries who try to exploit naïve investors , debt-holders or the depositor safety net provided by governments . Last but not least, the inherent human decision-making limitations  mean that actual human beings often fail to take the rational choices usually assumed in the standard academic literature. Regardless of why asset price bubbles arise, there is little doubt that they pose potential risks for financial stability, especially when they involve bank-provided debt finance. In terms of the ECB’s framework for the analysis of systemic risk , asset price bubbles can contribute to the build up of financial imbalances which can unwind suddenly and cause the collapse of the banking system, with serious consequences for the real economy. We know that asset price bubbles and financial crises can cause severe economic dislocation. This fact naturally leads to the next question I want to discuss. What can economic policy do about asset bubbles and financial imbalances? Here it is worth drawing a distinction between what economists call ‘ex ante’ and ‘ex post’ policies. These are the economic policy equivalents to ‘prevention’ and ‘cure’ in medicine. Once the financial system is gripped by the kind of fear and panic we saw after the collapse of Lehman Brothers in September 2008, ‘ex post’ or ‘cure’ policies are vital in order to restore confidence and prevent full-scale meltdown. This is why our actual experience during 2007-2009 was dominated by ‘ex post’ crisis management policies. This is the subject I want to turn to next. Once the global financial crisis intensified in the autumn of 2008, the ECB did not hesitate to use the full array of policy instruments at its disposal. 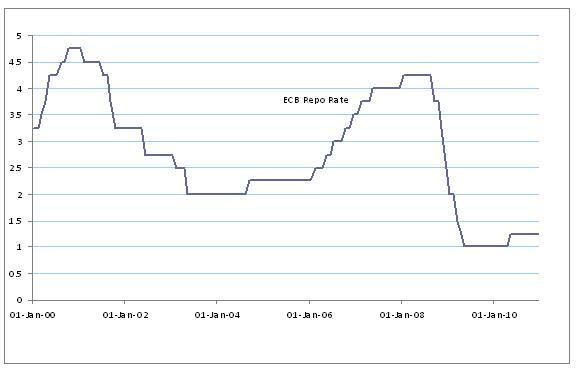 Interest rates were cut from 4.25% to 1% (Chart 3). The European Central Bank doubled its lending to euro area financial institutions in a matter of weeks (Chart 4). National governments took weak banks into public ownership or recapitalised them in order to restore the market’s confidence. What we were trying to avoid was another Great Depression. The seminal analysis of Milton Friedman and Anna Schwartz  taught us that the Federal Reserve’s failure to reduce interest rates and provide enough liquidity to the financial system was an important amplifying factor behind the economic collapse of 1929-1933. This time we made sure we avoided a similar scenario. 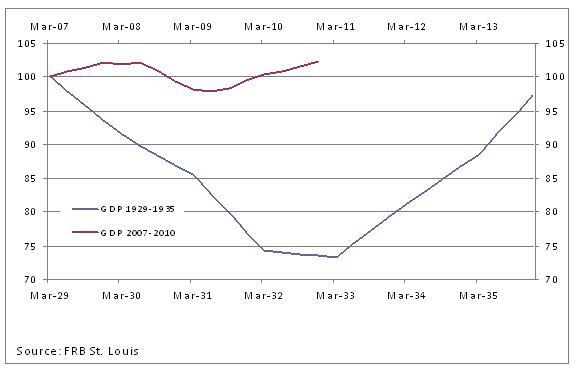 Chart 5 compares the evolution of real GDP in the US during the Great Depression and during the recent financial crisis. I focus on the US because of data availability for the Great Depression period. Between 1929 and 1933, US real output fell by more than a quarter. In contrast, between 2007 and 2009, US real GDP fell by around 5%. In the Euro area the recession was equally severe but, again, not comparable in scale to the events of 1929-1933. The Great Recession was painful but it was not a second Great Depression. While ‘ex post’ policies are an important part of policy-makers’ toolkit, they are by no means a ‘free lunch’. Dealing with the recent financial crisis carried a substantial fiscal cost . In particular, debt-to-GDP ratios have increased as a result of bank bail-outs as well as due to the effect of the economic downturn on fiscal revenues and social expenditures. For advanced economies, the IMF reports a median increase in the ratio of debt to GDP of 25 percentage points and a median direct bail-out cost of 6% of GDP. These fiscal strains are keenly felt throughout Europe at the current juncture. The policy conclusion I want to draw from these facts is: Even when the ‘ex post’ policy response is successful at attenuating the immediate impact of a financial crisis on the real economy, the build up of public debt carries substantial costs of its own. In matters of financial stability (just as in medicine), ‘prevention’ is always better than ‘cure’. Let me now turn to discussing ‘ex ante’ preventative policies. The crisis revealed that our ‘ex ante preventative’ policy tools were insufficient to deal with the build up of systemic risk. Many of the post-crisis efforts by central banks, regulators and national governments have, therefore, focused on rectifying this deficiency. An important lesson from recent crisis was that policies aimed at ensuring the stability of individual institutions (which is what micro-prudential regulation does) were not sufficient to prevent the under-pricing of risk and excessive balance sheet growth. Even though individual banks looked healthier than ever in 2007, the system as a whole was more fragile than ever. This is why, in January 2011, the European Systemic Risk Board (ESRB) was established and charged with ensuring the integrity of the EU’s financial system. The ESRB’s main tasks are threefold: to identify and prioritise systemic risks; to issue early warnings when significant systemic risks emerge; and to issue policy recommendations for remedial action in response to the risks it identifies. In addition, today’s globalised financial market implies that the efforts aimed at crisis prevention must have a global dimension. This is why agreeing the new Basel III capital and liquidity standards have been another important milestone in the efforts of the international central banking community to reduce systemic risk. Increasing the reliance of banks on ‘bail-in debt’ – debt instruments which convert into common equity when individual or system-wide solvency deteriorate beyond pre-specified levels. In addition, macro-prudential regulators throughout the world are acquiring new policy tools aimed at ‘leaning against the wind’ of financial imbalances and asset price bubbles. The most important examples of such tools are the counter-cyclical capital and liquidity buffers. These are new policy instruments and we still need to understand fully how and when we should deploy them. But one thing should be clear. Policy-makers throughout the world are determined to do all they can in order to avoid a repeat of the events of 2007-2009. The active use of macro-prudential policy will provide a new array of ‘ex ante’ policy instruments which can lean against asset price bubbles and reduce the pro-cyclicality of the financial system. Should monetary policy also be used to ‘lean’ against asset price bubbles and building imbalances? The importance of monetary policy for financial bubbles and imbalances has been underscored by growing empirical evidence  that holding interest rates too low for too long is likely to lead to declining lending standards and growing risk-taking in the banking system. This is associated with significantly higher defaults over time. Moreover, we have seen that the materialization of systemic risk and financial instabilities can lead to deep recessions associated with great economic costs, which in turn, carries risks for medium term price stability. The ECB is tasked with ensuring price stability in the medium term for the citizens of the Euro area. It is unique amongst central banks in having a two pillar approach which combines both economic and monetary analysis in order to arrive at the appropriate interest rate setting. To the extent that financial imbalances are accompanied by excessive monetary and credit growth, the ECB’s focus on medium term definitions of price stability as well as its use of the monetary pillar already provides some ‘leaning against the wind’. Work at the ECB  shows that the leaning against the wind attitude embedded in the ECB’s monetary analysis has contributed to containing the build-up of financial imbalances prior to the financial crisis. As a result, it has prevented a more significant fall out in economic activity during the crisis and larger risks to price stability. Therefore, this analysis shows that a cautious leaning against excessive money and credit growth and building financial imbalances as part of the monetary pillar can bring benefits not only for financial stability but also for price stability. The historical evidence clearly shows that asset price bubbles can build up over time and, if unchecked, start to pose significant risks to systemic stability. We have been reminded that the materialization of such risks can have great economic costs, not only due to low growth and losses of income, but also in terms of heavy burdens on public finances. So what can we learn for economic policy? First, we have to improve the general monitoring and analysis of asset price developments and potential financial imbalances. Second, we have to not only strengthen the micro prudential regulatory framework through better liquidity and capital provisions, but we also have to build up a strong macro prudential framework. The experiences since 2007 crisis have taught us that ensuring the stability of individual banks is not enough for the stability of the system as a whole. This is why we established the ESRB in January 2011 and tasked it with identifying and prioritising systemic risks, issuing early warnings when significant systemic risks emerge and issuing policy recommendations for remedial action. And third, we have to make use of our monetary policy framework to come by financial imbalances that go along with excessive growth in money and credit. Our monetary policy is focused on the medium term and grants a distinct role to the analysis of monetary and credit developments. This is instrumental that the ECB is not only ensuring medium term price stability, but also contributes to the stability of the financial system. Some key contributions to this ‘Behavioural Finance’ literature are in Thaler (1993) and Thaler (2005). See the December 2009 ECB Financial Stability Review and Trichet (2009). Borio and Zhu (2008), Maddaloni and Peydro (2011), Jimenez, Saurina, Ongena and Peydro (2010), Adrian and Shin (2011), Jimenez, Saurina, Ongena and Peydro (2010). Fahr, Motto, Rostagno, Smets and Tristani (2010). The paper uses simulations with the Christiano, Motto, Rostagno (2009) model.